Well, I am still not hundred percent convinced that this weblog matured enough for it's own cooking thread, but anyway, here we are again, after couple of months from original 'Little Chef' post, we now have two more videos in our channel - our ways of making Sushi and Pizza. It all started couple of days ago, with me passing by one of those 'healthy food' stores in the neighborhood where I usually buy Serbian, sort of, non-carbonated ginger ale juice that is very popular in this part of the world - especially mixed with lemonade and ice cream. Anyhow, I stepped in to buy a bottle and noticed a pack of nori sheets on the shelf. I didn't think twice, so I bought one and today we made sushi for the first time in our culinary history. This is how it looks. Well, looked. It is always fun when you start preparing a dish for the first time. To be honest, in the past, on many occasions, our first endeavors ended in complete failure. However, today, sushi surprised us nicely and all five rolls, more or less, turned out nice and in perfect shapes. Ok, first two almost fell on the floor due to not that great rolling cylinders but that didn't influence their incredible taste. One thing is for sure, after today, we definitely earned one more dish in our menu. 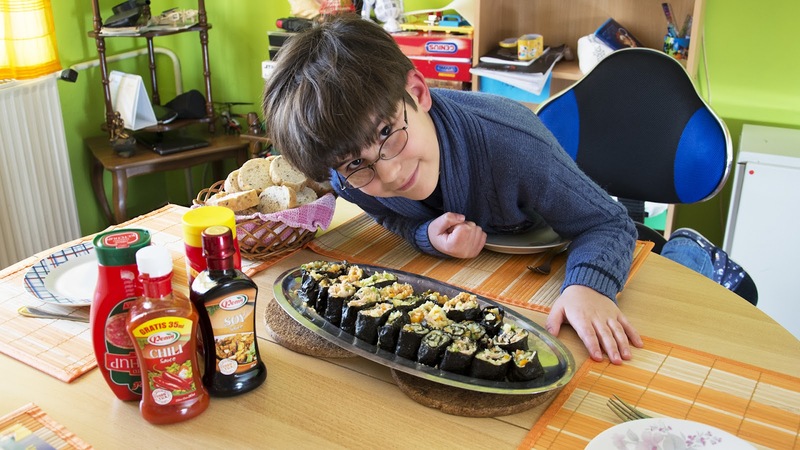 Ingredients: nori algae, salmon, tuna, squid, horseradish, green peas, mustard, carrots, soy & chili sauce, kurkuma. Next 'show' from our kitchen is actually the very first one we ever made. Only we didn't have that amount of experience in filming our videos (!) before and this one ended as long as a typical sitcom episode. Recently I found the time to do proper editing of the original material and this is the result. Anyway, originally filmed last summer, in this 'master piece' of ours, we are both taking presenter's spot, simply because as much as I tried to do, I couldn't cut me out of the video without spoiling the content. Never mind. Ingredients: flower, tomatoes, oregano, sausages, several types of cheese, mushrooms, olives, olive and sunflower oil. Perhaps not too much related to this post is story about Serbian Chevapchichi and the food in general, which reminds me of my earlier promise of making smoked meat and sausages and our way of preparing BBQ. That is definitely next in our schedule. Of course, if you liked these two meals and our play time, try not to miss our first blog post in the thread: Little Chef. This one contains preparation of corn dogs, domesticated sausages and carrot juice.